Three Card Poker is one of the most popular casino poker variations out there. Along with Caribbean Stud and Let It Ride, this game has a big following of players around the world. We have an article on Trey Poker, which is a game from Net Entertainment and features the same rules as this one. However, as players easily confuse that game and think it’s a whole other story, we’ll also do an article on this one. If you’re looking to play 3 Card Poker online, there are plenty of options. Players can play at any MicroGaming, PlayTech, Cryptologic or Net Entertainment Casino. To sum the indroductionary rant up – this game plays very similarly to Caribbean Stud, but with one significant difference. You only get 3 cards dealt as your hand, same applies to the dealer. Lets jump into the gameplay, rules and various aspects that are important when looking to play or actually playing this game. There are only 3 betting boxes in this casino poker variation and two of them are used for the main purpose – playing. The third one is a side bet betting box, shaped as a circle, and it allows you to wager on a quite specific outcome of the hand, that your hand will be equal or better than a pair. ”Ante” – as in most poker games, ante is a required wager that you have to place in order for the hand to be dealt. ”Play” – in some games this is known as the ”call” bet, but it’s simplified here and titled as the ”play” bet. If you want to continue with your hand and take it to the showdown for determining whether you’ve won, you’ll have to place it. This wager is equal in size to the ”ante”. ”Pair Up” – a side bet allowing you to predict whether your hand will be equally strong or better than a pair. Now you’ve gone through all the options that are offered in the game. It’s time to take a look on the payouts you can earn as well as a single basic, but significant rule for dealers hand. 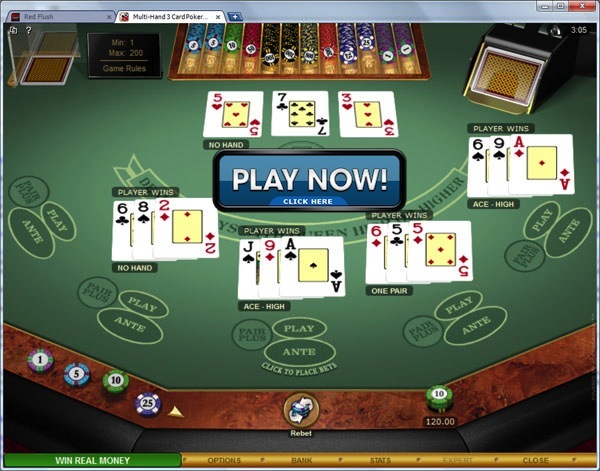 Three Card Poker features a basic payout chart that offers a chance to win up to 40 times your initial bet. There are two types of payouts that are awarded either for the ”Pair Up” or ”Ante Bonus” bets. These payouts are independent and awarded regardless of the outcome for the particular hand. You can lose to the dealer, but hold a pair or better, which will still award you at least an even money payout. Dealer will have to hold a qualifying hand, for these payouts to be accurate. Also, payout odds are on top of any regular payouts that are even money. Dealers hand is considered as a qualifying one, when it’s at least queen high or better. So whenever dealer holds at least this hand, you’ve got a chance at getting a nice payout. If dealer does not qualify, you instantly win an even money payout on your ”ante bet”, while the ”play bet” is considered as a push. Don’t wager any money on the ”Pair Up” sidebet as the frequency of getting a pair using three hole cards is way too small for it to be worth it, given how low the payouts are. Always place the ”play” wager, when you hold queen high or a hand that is better than it. You’ve just learned how to play three card poker, why not use that knowledge? If you’re a player outside USA, I would suggest to get your first experience at Winner Casino! They offer $/£30 in completely free credits. No deposit or credit card date needed, simply sign up and the cash will be waiting for you! Join Now – CLICK HERE!